It's the hottest ticket in town and it's FREE! 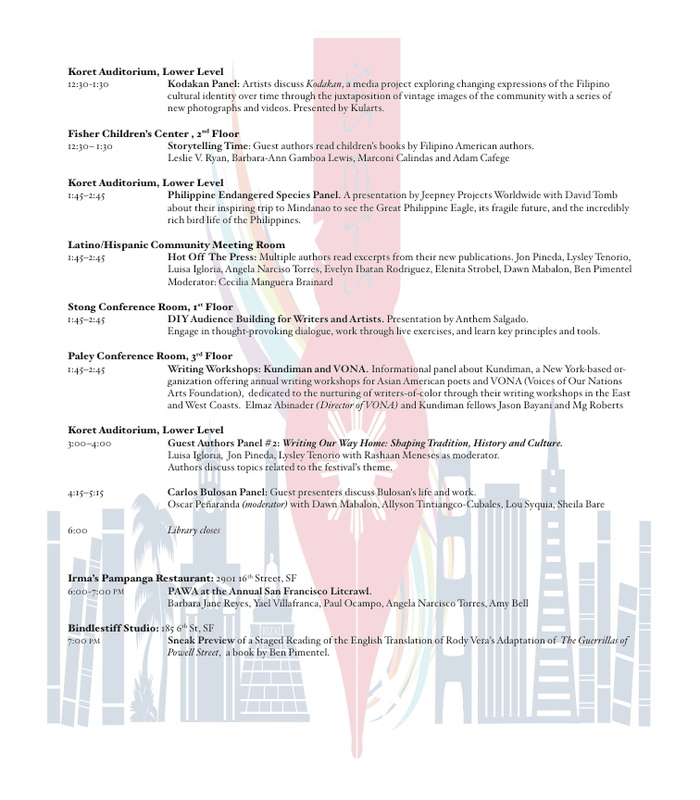 The 2nd Filipino American International Book Festival (Filbookfest) is taking place starting Friday, Oct. 18 until Sunday, Oct. 20 at the San Francisco Main Library on 100 Larkin St. at the Civic Center (take BART or Muni to the Civic Center station). Brought to you by the Philippine American Writers and Artists, Inc. (PAWA), the San Francisco Public Library and its Filipino American Center, and the Philippine Consulate in cooperation with Chevron, the University of San Francisco's Yuchengco Philippine Studies Program, and TFC, Filbookfest offers an array of events that showcase the best and most enduring aspects of Filipino culture. a calligraphy demonstration and Kulintronica, which combines traditional kulintang beats and electronic dance music. All activities will take place at the San Francisco Main Library's Koret Auditorium and Latino Rooms A and B. The San Francisco Main Library is located at 100 Larkin Street, San Francisco 94102. Everyone is invited to this family event. For more information, go to www.pawainc/filbookfest.